This, the middle 'apple' in the Manzana de la Discordia, was the house that started the Passeig de Gràcia's style wars. Jaws dropped when it was unveiled in 1898: it was dubbed ‘the apotheosis of decorative arts’. With this house a bar had been set for every tycoon in the Eixample to rival, and it was set very high indeed. Like the other three Modernista houses on the block, it was essentially a remodelling job. Chocolate baron Antoni Amatller i Costa had become bored with his townhouse, and in the spirit of the Renaixença that had gripped Barcelona, hired Puig i Cadafalch to give it a Gothic makeover. The design of the house was Puig's response to Amattler's needs and interests. The chocolate baron was an amateur photographer and had a studio in the attic, which led Puig to design its unusual stepped gable to hide it from the street. 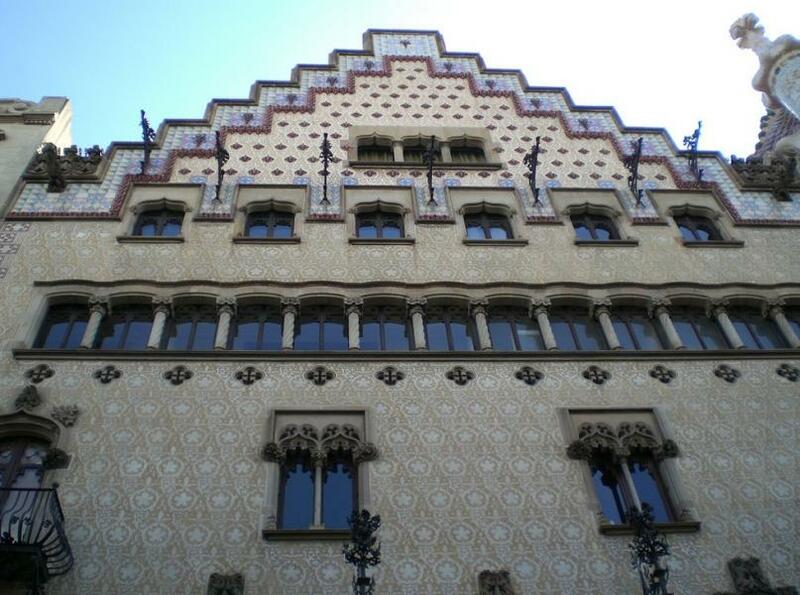 It also served as a reference to Flanders, a region Amatller frequently visited on chocolate business.The façade is something of a chocolate box itself, with its sgraffito pattern, shimming blue, pink and cream tiles and ceramic plaques. In fact, you can guess all of Amatller's passions by studying Eusebi Arnau's playful sculptures that decorate the lower façade. 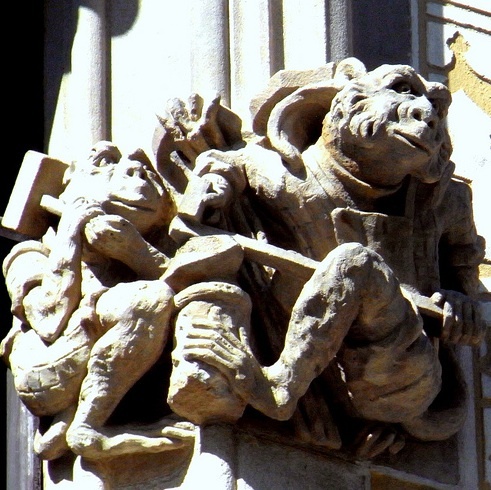 His Catalan nationalism is expressed in St George clobbering the dragon, watched by his beautiful princess; allegorical figures represent the lofty arts of painting, sculpture, architecture and music, while working class monkeys and rabbits do the actual labour. A donkey engrossed in a book while his friend works a camera are references to Amatller’s love of reading and photography. Frogs blowing glass and pigs making pottery by the third window hint at Amatller’s beloved Greek vase and Roman glass collection. A slight hiccup occurred during construction when Senyora Amatller ran off with an opera singer, but that too is reflected in the façade: the projecting tribuna, which in the best houses was used to show off the latest fashions to less fortunate members of the public passing by in the street, was built off to the side, near the bedroom of Amatller's daughter, the new lady of the house. The window decoration rises to form an almond tree, a play on the name 'Amatller', with a curling letter ‘A’. The same motif embellishes the grand staircase, along with a stern eagle and a lovely stained-glass skylight. The original elevator still wheezes up and down the floors; near it, three little sculptures in the vaulted ceiling demonstrate how to make chocolate: the first creature crushes the beans, the second stirs it all up – and the greedy little third has made himself sick. The main floor retains much of its rich decoration, more sculptures by Eusebi Arnau and woodwork by Gaspar Homar, which can be visited on a guided tour (which includes a chocolate tasting). The second floor houses the Institut Amatller d’Art Hispànic, founded by Teresa Amatller in 1942, with a photo library (open Mon-Fri 10-3); it occasionally holds special exhibitions. Housed on the ground floor, have a look at Bagués, Barcelona's finest jeweller's, having merged in 1985 with two of the most prestigious Catalan companies, Masriera and Carreras, with roots that stretch back to the 18th century. But its greatest master was Lluís Masriera, who created Modernista designs in the early 1900s, designs that have been integrated into the Bagués collection. Adm Hour-long guided tours in English at 11am (no more than 12 people at a time) €15; €13.50 over 65s and students; €7 ages 6-12; under 6 free. Express 30 minute tours in English, Spanish and Catalan at 11.30am, 12.30pm, and every half hour from 3.30-6pm. Book online.